Tokamak itsself doesn't provide a class for springs. But as they are a very interesting and useful element in physics simulations I have tried to create such a class. It works quite well but I am not yet completely satisfied with it. If you want to help to improve it, please e-mail me. We could make it to a Tokamak Community Spring class! A theoretical spring is quite simple: It is an object with no mass and which does not collide with objects. It connects two bodies, either rigid-rigid or rigid-animated. Therefore is applies a force on the rigid objects in the direction of the spring itsself. The strength of the force is dependent of the extension of the spring. It has a default length at which there is no force. If the spring is contracted or extended, there will be a force. 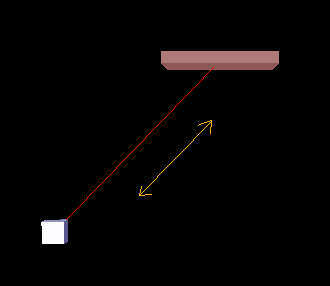 In the first image the blue line represents a "fixed" spring, the angle between the bodies and the spring remains at 90°. In the second image there is the same spring connecting the bodies, but after a short time, the upper body gets a little sidewards movement and falls down - the spring is at default length and thus not applying any force. So what to do? I added a "fixation" to my springs which creates torques and tangential forces. But they are not yet completely correct implemented, if the spring is fixed at a point different from the center. But in most cases it works quite well. The spring class can be used in multiple ways and so I thought I'd include several samples. By pressing "i","o","k" you can apply an impulse left, right or upwards (in samples 1 and 2 on the small box, in the other examples on the upper flat box). By pressing "p" you can let fall some spheres down. This way you can watch the behavior of the springs better! 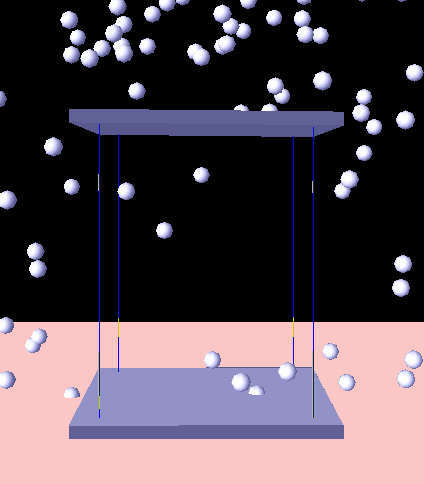 This first example shows an unfixed spring betweeen an animated and a rigid body. The second example shows the same spring - but fixed at both bodies. This is shown by the short yellow line which points in fixation direction. This line is highlighted in the first picture. After the rigid body has been moved to the fixation direction it only swings in this direction. By the way, the spring is also fixed at the rigid body (small box), but it turns quite fast to get the right orientation, so you cannot see the yellow line anymore, it's behind the red one. 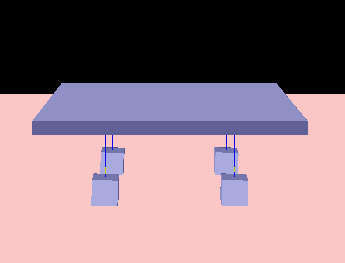 Here you can see two flat boxes connected via a fixed spring. This must be quite a "strong" spring to keep the bodies in this position. Here, for the first time, you can see an example with more than one spring. The flat box has four boxes below it - each connected via a spring. Of course you can also connect two flat boxes with more than one spring! Before I will explain how the spring class works, I will tell you how you can use it. If this is enough for you, you do not have to read on after this section (but you can also learn how controllers work!). What's happening? First we call the CreateSpring() function of CTokSim (thus it knows about the spring and can display it). 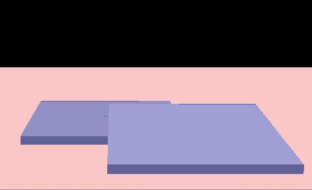 The damping factor - here very small - is similar to the damping of joints. It is often useful to "calm down" your simulation. By default, a spring is connected at the bodies' center. If you want to connect the spring at the surface, you have to call SetConnPos1/2(). This is done here to connect the spring at the smallBox' surface (smallBox is "body 1", because it was passed first). This is all you need for an unfixed spring. The first three lines are well known to you and so are the next four lines. The damping factor is a bit higher now. And now starts the interesting stuff. "SFixationInfo" is a struct type which contains all information required for fixing the spring. First we set the bFixed values both to true. Then we set the connection directions - relative to each body's coordinate system. As soon as the spring is fixed, there will be torques and tangential forces created. Their strength (fTangentForceFactor and fTorque Factor) defines, how fast the spring moves the objects so that they are in the desired position relative to each other. These torques and forces must be damped, otherwise you will get another strong oscillation. Therefore you can set the fTangentDamping and fAngularDamping. To get these values is a bit tricky, don't choose them to high, if your accuracy (->Advance()/CalculateNextFrame()) is not high enough. But if you have found them, things work quite nice. Now the struct's values have been set - we can fix the spring by FixSpring(). This is all. The other samples can be created with this knowledge! Have fun using the springs! which is something like the heart of CTokSpring. This callback function is registered as a controller for both bodies in the constructor of CTokSpring (if both are rigid). As second parameter the timestep is 0.0f - which means that the callback is called each time when "Advance()" is called. (A timestep smaller than the one passed to Advance is not possible or has no effect.) 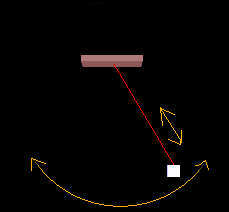 In this callback function the spring applies its force/torque on the body. All other functions are simple helper functions. So how does RigidBodyControllerCallback() compute the forces? Body2.Velocity.SetZero(); //this might be wrong if the user moves his anim body. //but this case is not yet supported here. //how long is the spring right now? (forceAtConnPos has been initializes to 0 before, so the "-=" is equivalent to "=-"). The "-" must be set because the force is directed towards the body we are controlling here. This would be all - for the most simple spring you can imagine: unfixed and not damped. This simply takes the difference of the velocities of the bodies and creates a force against the velocity - multiplied with the damping factor. The line which handles the damping for fixed springs uses a projection of the velocity difference on "dir" (the spring direction). This is all nice - but applying the forces and torques was the problem I got. 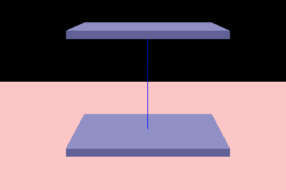 If you set a force at a point different from the center it produces a torque. Calling SetTorque() overwrites the other torque and vice versa. If you can improve them, please contact me!